Product #21524 | SKU QNS111 | 0.0 (no ratings yet) Thanks for your rating! 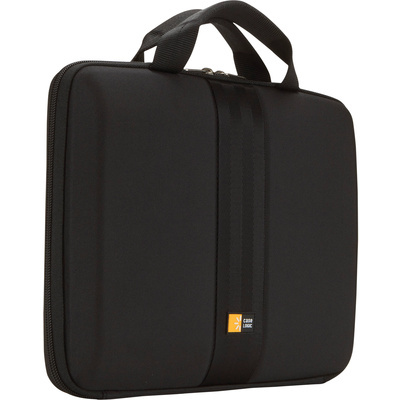 The 11.6" Netbook Sleeve from Case Logic has a clamshell design that allows you to use your laptop or netbook while it's still inside the sleeve. When unzipped, the sleeve is held open by a side elastic band that enables you to work while seated. The moulded EVA (ethylene vinyl acetate) foam sleeve contains quilted padding to hold your netbook in place. Ventilation channels are provided to help prevent your netbook from overheating. Two top zippers provide access to the interior. Two padded top carry handles give the sleeve a briefcase style design.